Hand-dyed 100% BFL self-striping sock yarn. 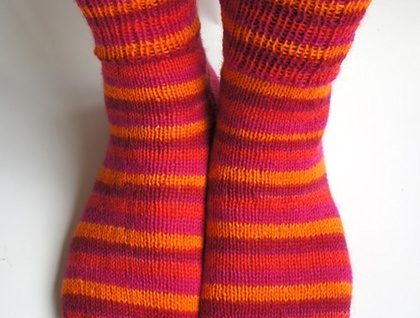 This yarn will make stripy socks automatically! 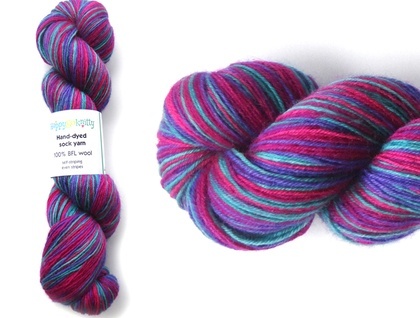 BFL (Blue Face Leicester) is the yarn the sock knitters all over the world is raving about! This yarn has got a long fiber and is spun with a high twist which makes it suitable for socks, but it can be used for cuffs, mittens, baby clothes, shawls or any other kind of 4ply knitting. Needles 2.5–3mm (4mm for shawls). This is superwash wool so can be put in the washing machine. The listing is for one 100g skein. This yarn is hand-dyed, colour variations are intentional. After dyeing, the yarn has been thoroughly washed and rinsed. The utmost has been done to reproduce the colours accurately, but please keep in mind that different screens vary. Contact happygoknitty to enquire about payment or shipping options.